I want apologize for some of my comments this past Sunday in my homily, namely the remarks about not forcing your kids to come to church. I would also like to put the words in a better context and assure you that I will say something this Sunday to correct what I said this past week. First off, I want you to know that I love and care for each child in our church as much as my own children. I would never wish them harm and would never want to see any harm come to them. I firmly believe that bringing your children to church, especially young children is vital to their spiritual development. When we partake of the Eucharist together, we are uniting ourselves to one another, to Christ the Lord, and in a very real way we are receiving the spiritual nutrients to sustain us in this fallen world. Second, we have very little time as parents to impart just exactly what is occurring at every church encounter. Relatively speaking, we have around 14 to 15 years with our children before their minds are pretty much made up and worldly forces start to manifest themselves. Naturally, this can vary a bit depending upon the child, but in my experience this is the norm. While this may seem like an eternity to parents with young children, it definitely flies by quickly. Third, while we can force our little ones to come to church (and sometimes this is just simply an imperative, we must force them because it is for their own spiritual good), we must try as hard as we can not to make this the norm. I also firmly believe with all my heart that parents must look to teach about faith, and specifically their faith, at every opportunity. 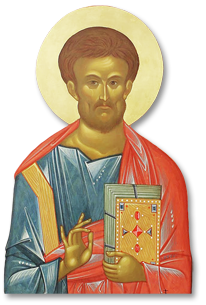 St. Paul said to the Corinthians: “Give no offense, either to the Jews or to the Greeks or to the church of God, just as I also please all men in all things, not seeking my own profit, but the profit of many, that they may be saved.” (I Corinthians 10:31-32). His expression of “just as I also please all men in all things,” can be seen by parents as “just as I also please all children in all things … that they may be saved.” What I take from this little passage of scripture, is that every parent must try whatever reasonable means work for them to teach about their faith and to keep in mind that the clock is ticking. I mentioned on Sunday that faith is not something that can be taught, it is something that must be encouraged to grow. This is not a new idea; in fact, the concept was introduced to me in seminary by the late Dr. John Boojamra of blessed memory. At the time he told this to our class, he also told us the story about the great math teacher Jaime Escalante and made our class watch the movie, Stand and Deliver. In 1998, one of my parishioners, Dr. James Nemitz, was named Teacher of the Year for the entire state of West Virginia. I asked Dr. Nemitz one day what the secret was to his success, and his answer was almost identical to words spoken by Mr. Escalante. He said, “I set the bar high, and I do everything in my power to help my students achieve it.” This lofty goal is not just for math teachers or anatomy professors, it is for parents. If you have never seen Stand and Deliver, I highly recommend it to remind you of what kind of passion it takes to be a really good teacher, and thus a really good parent. If your child hates to come to church, please seek me or Fr. Jon out to discuss this further. Do your children have friends in the church? Are they actively participating in church events? Do you express to them why you come to church? It can sometimes be as simple as, “I want to go to church today because Grandma and Grandpa are going to be there too.” Friendships in the church go a very long way for young people. First and foremost, talk about your faith. What does Christ mean to you and who is Christ? If Christ is not really important to you, why would you expect Christ to be important to your children? Second, don’t be a hypocrite. I have watched many hypocrites over the years. I haven’t seen everything, but I’ve seen a lot in my lifetime, and believe me hypocrisy is one of the single biggest killers of faith. Third, stop forcing encourage your kids to come to church by any reasonable means. If they don’t want to come there is a reason, and it is only going to get worse as they get older. Keep in mind, our Lord never forced anyone to follow Him. Fourth, lead by example. Do you show love? Do you say, “I love you?” How do you say, “I love you?” Do you ever utter the words, “I love Jesus?” This point, “lead by example,” is critical. Back to question one, the Lord asks of us, “Who do you say that I am?” Love requires action. It requires effort. Have you shown love for your fellow man? We have a wonderful homeless feeding program here at St. Luke’s. Have you ever been and do you take your children with you? Do you give of your material possessions? Do you read the scriptures or is your bible just a book end at home? Have you read the bible to your children and asked them about it? Do you pray at home and do you fast together as a family? Now let me say a few words about the teenage years. They are almost always the toughest years. I am currently trying to grow some grass in my backyard and some of it is going well, and some of it not so well. Grass seed isn’t quite a mustard seed but it helps to make the analogy. Grass seed needs soil, water, sun, and nutrients to grow. If any of those ingredients is not there, the grass will die. And after the little stocks make their way out of the ground, if you cut it too early, the grass will die. And if you let your dog out and they decide to do a number on the grass, it will die as well. Children are like little grass seeds, and it is not enough to plant them in the church and be nurtured on the Eucharist and the word of God. They must also be protected from outside elements and watered with the love of parents for a very long time. If your only way of getting your child to attend church is because of the phrase “Because I said so,” it’s a pretty good bet that you will have lost them by their teenage years when the weeds and toxicity of the world start to bombard them. The teenage years are equivalent to the grass stocks just coming out of the ground and they must be protected from the inadvertent gardener plowing them under before the roots are completely formed or the neighborhood dog coming over to pay a visit and relieve himself. During the teenage years, your children are exposed to unbelievable things, and if you are not keenly aware of what they are doing and who they are associating with, there is a strong possibility that they will be exposed to things that are very toxic and have the potential to kill your child’s faith. At every opportunity with your children, you have an opportunity to make it a learning experience. I said this past Sunday, chilldren need to discover faith, and I believe parents can help with this discovery by placing seeds of faith. This can happen, for example, by asking your children about the amazing fact that every night the sun sets and every day the sun rises. The world is so perfectly tuned that there is never a day off for the moon or the stars. Children are amazingly curious and we can tap into that curiosity and harness it. Just asking your children about the perfection of the universe can open the door for many other types of faith discoveries. Isn’t it amazing that plants and animals can live for many years yet we can’t make a computer that can last for more than 10 years? For many years, my father and I “worked” on cars together. It was really late into my teenage years when I tried “working” on cars without him and realized how much I relied up him to solve the mechanical problems while he let me discover the inner workings of an engine. I realize now that he didn’t need me to change the oil or change out spark plugs. He did it to teach me about cars. We can teach about our faith the same way just by helping out a neighbor or sending a get well card and inviting our children to do the same. All this being said, there does come a time when you must let your children (even your adult children) come to the faith on their own and trust that you have done all that you could to raise them and help them on their own spiritual journey. This is also where your teaching methods will be challenged significantly. “Because I said so” just doesn’t work anymore. My advice is that you take advantage of the time God has given you before the teenage years to build your child’s faith roots as much as possible, and then, hope and pray that their transition into adulthood goes smoothly, keeping in mind that your role as a parent means that you never stop teaching. Again, I sincerely apologize for my careless remarks this Sunday and ask for your forgiveness. This entry was posted on Tuesday, June 23rd, 2015 at 1:55 pm	and is filed under Fr Michael's Blog. You can follow any responses to this entry through the RSS 2.0 feed. Both comments and pings are currently closed.